We are the exclusive distributor for Swizerland and Italy of soli stabilizaion system INOVGREEN (IG). INOVGREEN (IG) soil stabilization systems, which offers a unique and revolutionary paver system, which provides permeable ground reinforcement solutions across an extremely wide range of applications. 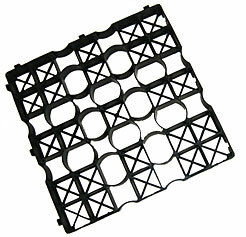 Our product is also known as parking grid and eco grid, is used to stabilize the green areas and surfaces with different types of aggregates such as grit, gravel, etc. Eco grid not only allows you to obtain a stable surface, but also the surface that withstand very high loads (depending on the model used - up to 310 ton / m2). 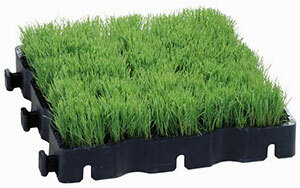 Eco grid is the most popular product of its kind in the European Union - ecological (made from 100% recycled materials), permeable to water and allow natural vegetation. Eco grid provides an excellent alternative to the standard solutions such as paving stones and is very resistant and extremely flexibly, completely indestructibly - ideally for public investments, especially where passage of very heavy cargoes is provided. 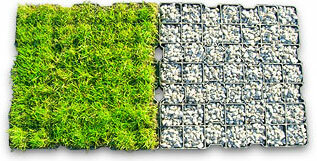 Eco grid provides an excellent alternative to the standard solutions such as paving stones. Eco grid are neutral for the environment (produced from 100% recycled materials), resistant to both low and high temperatures (-30 C to +85 C). Eco grid brings high strength, excellent durability and simple installation to heavy duty ground reinforcement applications and high traffic areas, additionally, coated surface remains biologically active, 90% permeable. Eco grid is normally laid on a free draining stone base, eliminating the requirement for drainage pipework, and returning storm water to the water table. IG eco grid have been used for example for the construction of the grassy parking areas at Heathrow Airport and Olympic sites in London, as well as Schiphol Airport in Amsterdam, Airbus factory in France - as roads between the hangars, fire building roads in Germany and Belgium. In Poland used for the construction of parking lots at sports facilities (speedway stadium in Gorzow, Legia stadium in Warsaw), supermarkets (Tesco, Lidl,) as well as many other public buildings, businesses and private properties.